Many thanks to those who so diligently dug my 850 mW signal out of the din this evening. It was an evening for experimenting, but then isn’t that what Ham Radio is all about? This was the debut of my little 3 ounce SoftRock Ensemble SDR PCB which won’t quite make a full watt of power output. Just finished building a little 5 watt 40 meter amplifier for it, but my little LiPO won’t power it so “the linear” stayed on the shelf tonight. The thing is, do we count the laptop? Yes, probably so but since my score is so low anyway, it doesn’t make much difference. Most of us all probably have our computer on during Sprints for logging or checking names and tonight was really just a lark anyhow. So thank you for your help tonight trying something new (for me). K-2, 20 Meter EDZ, SW P/S. Lots of QRM on 40 until 02:00UTC. Fun event with contacts on 20, 40 and 80. Station : IC703, 90 ft doublet. Well, I doubled last month's Q-production. 40 was the workhorse band. Tnx to stalwarts: K4BAI, K5JHP, and WB5BKL. It's been a while for N5GW and WA8ZBT to go into the log. And tnx to W3KC for a new entry into the log. I could barely hear W5ACM. Not good enough for a Q. Andy, you need to point your vertical more in my direction. The FT-817 and the new 40 meter EFHWA worked well tonight. I had the KX3 with internal NiMH battery at 3W to the CFZ. The bands seemed to be in bad shape including few and weak signals generally. Especially 20M was disappointing. A check of the solar report revealed a high A index and an R1 blackout. I suppose at least a few ops stayed away because of anticipated poor conditions. However, doubles with WB4MNK, NK6A, NQ2W, W3KC and K4BAI helped. Anyway I was glad to be back after missing last month's outing. FT1000MP, 5W, TH6DXX, dipole, inverted vee. QSOs by band: 20M: 7; 40M: 15; 80M: 5. Good condiitons on three bands, but participating was way down from last month. 20M was open from GA to NY, IL, WI, TX, and FL, best DX was NK6A in CA. 40M had no skip zone and QSOs were made in GA, AL, and FL and out as far as NK6A in CA. 80M was in good shape with easy QSOs with the few who tried the band including W3KC in MD and two TX stations. I heard NK9G on 80M but no QSO. I heard WA5RML on 80 in QSO with WA8ZBT, but Andy was under my noise level. Fortunately, I went back to 40 near the end and worked Andy on that band. Thanks for all QSOs and let's have a big turn out for June's Spartan Sprint. Thanks to long-distance technical assistance from KD1JV, my ATS3A has been repaired. I feel that I spent the whole event just getting reaquainted with the radio. I still have a small issue with 40M reception and the contacts on the keyer paddle (super-thin spruce plywood with copper contact points). The two 200 mAh LiPo batteries did quite well, but the power output with a nominal 7.4 VDC is 3 Watts. More or bigger batteries would mean more weight. I only had three QSOs on 20M (NK6A, WB4MNK and NK9G) and only two on 80M (WB5BKL and WA8ZBT). The other six contacts were all on 40M - four with Texas stations, but no luck hearing WA5BUC. It was an excellent event with my favorite ATS rig back on the air again! Thanks to all for a fun event. K1 at 5 W to a 2-element mini-beam at 25 ft for 10, 15, and 20 meters, an inverted vee at 40 ft for 40 m, and a homebrewed, near-bottom loaded, ground mounted vertical for 80 m. My homebrew paddle behaved a little better this month. 20 meters netted 11 QSOs, 40 allowed 7 QSOs, and 80 provided 3. Not a bad way to spend an evening. Two banders with K4BAI, WB4MNK, N5GW, and W3KC. Three banders with WB5BKL and WA8ZBT. The 20-40-80 pipeline from NY to TX was open - 8 contacts with TX sprinters - FB! I hope to hear you all and more next month. EDZepp. Only 9 states this time. Tried 15M and though RBN said I was getting out well, nothing heard. Worked NQ2W and K4BAI on 20, 40 and 80M. Made more QSOs in the second hour - how unusual. My thanks to all. Had fun. WOW!!! What a fantastic sprint!!! Started out on 15m with my Hex-Beam. Only got 2 real quick contacts on the band. Quickly switched to 20m, still on the Hex, and got 10 contacts in 33 minutes. Went to the dipole on 40m, and got 6 contacts in 40 minutes. I thought 40m was pretty bad, but on 80m it was worse, with only 4 contacts in so minutes. Heard some old calls, and some new. Looking forward to 5 May. Thanks to everyone for the contacts, you guys are all fantastic!!! My first time. Very fun. I like how scoring is dependent on station weight. Next time I'm using my Te-Ne-Ke and taking 8oz off my weight. Antenna is a 63' long 4-band (40/20/15/10) half wave end-fed wire with a broadband coupler of my own design. I love switching bands without re-tuning. Both 20 and 40 sounded good down here in Florida this evening with good signals and little noise for a change. That was one fun hour. Many thanks to those who copied me with my highly compromised antenna (thank you HOA). The Big Signals of the evening, not counting the fellow just down the road in New Smyrna Beach, were NQ2W and AB9CA, both just pounding into Florida. K1 with good results. T-storms were coming in from the west. Limited time on the air. Great ops with good ears make these Sprints fun events. About 2/3 of the contacts were made on 40 and the rest on 20. Bands were noisy as storms were moving up the coast. As for my station weight, I don't know for sure: 12 amp power supply, heavy Bencher paddle, Sierra radio - gotta be close to 30 lbs. Best laid plans.... Was ready to do the sprint this evening but a major thunderstorm moved in 15 minutes before the start. Hope the rest of you had a great evening. See you May 5. Signals were real weak. In the words of one of my serious contester buddies, "Today is not a great day to work HF DX anyway. Bands still recovering from the last Solar Event." That was evident in the weak signals I was barely hearing above the noise. And then...some neighbor switch on their something and my noise went 2-3 S-units above all other QRP signals. I gave up at that point.The good news is that I am back on the air after 2.5 years off. Now I just need to find my keyer again. One contact in the April SP on 21 MHz. Great way to spend an evening. Thanks to all who worked me into their logs. TRI BANDER could only muster 2w tonight due to a almost dead battery. Always amazed at what can be done with QRP and some wire hanging in a tree. The April Sprint was interesting here. Put up a new 40 meter EFHWA (at 10 feet and perpendicular to my powerlines). It hears much better. Had 6 Q's, but only 3 in the Spartan Sprint: K5JHP, AB9CA, and WB5BKL. Two Qs were ragchews (Round Rock TX and AZ) and one Q with W1AW/3 (PA). Hope to hear more Sprinters in May. I operated a K2 at 3W for 15 minutes. Best DX was Randy K7TQ in ID. 20 meters only... signals strong. Thanks to all for the Qs. ATS-3, touch keyer, homebrew Zmatch to 88' doublet up 60'. Got a late start, but 20 meters stayed active into the 2nd hour of the Sprint. Then picked up 6 more on 40m. 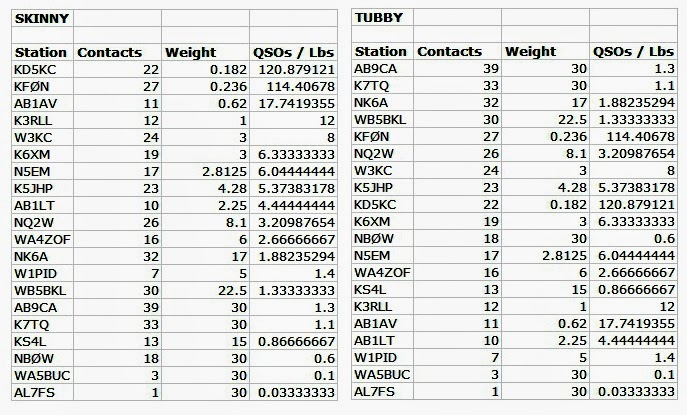 Both bands had serious QSB, requiring repeats from stations who had been strong to start. Never made it to 80m for my locals... Fun as always, and managed to keep hunting until contest end at 11pm here. Elecraft K3/5w with 44' vertical dipole and 80m inv. V at 45'. Excellent conditions on 20m, with very little QRN, but few stations heard here. 40m was good, but noisy. Nobody heard on 80m. Thanks for the QSOs! K1 at 5 W to a 2-element mini-beam at 25 ft for 10, 15, and 20 meters and an inverted vee at 40 ft for 40 m. My homebrew paddle was acting up again and I had to take a break and adjust it. Sorry for some rough sending, initially. It did get a little better post-adjustment. Pretty decent band conditions - 10 QSOs on 20 and 16 on 40. 40 produced QSOs with SPers from New England to California and states in between. I thought about going to 80 but didn't see much activity there. I stuck it out on 40 to the end. Had lots of two-banders - AB9CA, K7TQ, KF0N, K5JHP, N5EM, WB5BKL, and NB0W. Great fun! Looking forward to next month. Invite a friend to participate! The contest seemed well attended and conditions were fair. It was nice to hear 20 meters open. A rather high A- index indicated increased X-ray activity which did seem to increase absorption somewhat. Signals were noticeably weaker on 40 meters but still readable. Warmer Spring temperatures have abated my line noise somewhat. WA4ZOF had a great 2-watt signal from Alabama. My best DX for the evening was with NK6A and K6XM, both in CA on 40M. Many thanks to all who called in. Where else could you have this much fun with a diminutive little rig and a power source not much bigger than your thumb! was K5JHP. More activity than expected considering the basketball final competition. My thanks to all. Had fun. A good evening here in ID with a nice balance between 20 m and 40 m (15 Qs on 20 and 18 Qs on 40). There were 8 folks that I got on both bands, KFØN, W3KC, KD5KC, NBØW, K5JHP, NK9G, NQ2W, and NK6A. Thanks to all who stopped by. Nice Sprint - conditions seemed good - summer QRN is picking up. Many thanks to those who dug really deep to copy me several times! Looking forward to May. Got home late from work so missed the first hour, but 20 meters was still open to the east coast and I worked several new calls for the first time. Switched to 40 after 20 dried up and worked a few more. Only had three two banders tonight – N7LT, WA8ZBT, and W3KC. There appeared to be a pretty good turn out tonight and conditions were good – especially on 20. Thanks to all. band was noisy but not as bad as it has been lately. Hope to see everyone in May's Sprint!